I don’t really know why, but I seem to be spending a lot of time at the moment reviewing proposals and contributions for conferences and publications. And whilst there is much to be learned from all the ideas being put forward it is time consuming and sometimes feels a very isolated and perhaps archaic process. I fond it difficult to decide the standards or criteria I am reviewing against. How important is clarity of thinking, originality, creativity? How important is it that the author includes copious references to previous work? Are we looking for depth or breadth? How important is the standard of English, particularly for those writing in a second or third language? In this world of social software the whole review process seems somewhat archaic. It relies very much on individuals, all working in isolation. People write an abstract according to a call for proposals (and I am well aware of how difficult it is to write such calls – unless of course it is one of these multi track conferences which just include everything!). The reviews are allocated to a series of individuals for blind review. They do their work in isolation and then according to often subjective criteria, the proposal is accepted or rejected. OK, sometimes there is the opportunity to make a conditional acceptance based on changes to the proposal. and of course, you are encouraged to provide feedback to the author. But all too often feedback is limited and pressure of time prevents organisers allowing a conditional acceptance. How could social software help with this? As usual I think it is a socio technical solution we need to look for, rather than an adoption of technologies per se. Most conferences have adopted software to help with the conference organising and review procedures but as happens all to often that software has been developed to manage existing processes more efficiently with no thought into how we could transform practices. One big issue is the anonymity of the review procedure. I can see many reasons to support this, but it is a big barrier to providing support in improving submissions. If we move to non blind reviewing, then we could develop systems to support a discourse between submitters and reviewers, where both become part of the knowledge creation process. and in added benefit of such a discourse could be to clarify and make transparent the criteria being used for reviews. reviewers would have more of a role as mentors rather than assessors or gatekeepers. This would not really require sophisticated technological development. It would really just need a simple booking system to arrange for a review and feedback session, together with video, audio or text conferencing functionality. More importantly perhaps it might help us in rethinking the role of individual and collective work in the academic and scholarly forms of publishing and knowledge development. I suspect a considerable barrier is the idea of the ‘Doctor Father’ – that such a process would challenge the authority of professors and doctorate supervisors. My experience, based on talking to many PhD students, is that the supervisory role does not work particularly well. It was developed when the principle role of universities was research and was designed to induct students into a community of practice as a researcher. With the changing role of universities plus the fact that many students are no longer committed to a long term career in academia (even if they could get a job) such processes have become less than functional. Better I think to develop processes of support based on wider communities than the narrow confines of a single university department. I’ve been enjoying the Purpos/ed debate on the purpose of education. 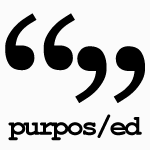 If you have not seen it Purpos/ed aims as a “non-partisan, location-independent organization … to kickstart a debate around the question: What’s the purpose of education? Although they say they have a three year plan, the first action, e daily 500 word blog by invited participants, has proved lively. Even more encouraging seems to be that those not on the ‘official’ list, are blogging, linking and using the Purpos/ed logo. And a Spanish language site is likely to launch in the near future. I am down to contribute my 500 words sometime in March. But I cannot resist commenting on the contributions so far. Most people have focused on education for creativity and liberation, for self fulfillment, for personal development, for expressing hopes and desires. Contributions have been open, personal and optimistic. Most seem to be loosely based within an Enlightenment idea with education promoting critical thinking and reasoning and the development of knowledge through sensation and reflection. These are all worthy ideas with which I cannot disagree. But if Purpos/ed is to open this debate, we need to go further. Within advanced industrialized countries education has become seen as largely a means of providing the skills and competencies needed by the economy. I suspect many of the contributions to Pupos/ed are a kneejerk reaction against such economic reductionism. Yet education does have an important economic and social purpose in our societies, and potentially a purpose that goes beyond the mere drilling of employability skills. Education is intrinsically linked to knowledge development and to innovation. Many of the contributions to Pupos/ed seem to have been framed within a overtly academic approach to learning. Yet education could have a key purpose in helping people to shape and control the use of technology within society and through that the forms of production within our economies. Here vocational and technical education have a central role to play. Yet within the UK we have largely ignored vocational education. essentially education provides a credential prior to starting employment. And thus the link between learning and work becomes lost, in terms of our understandings of the role and organization of work. Indeed the provision of employment is subject to mysterious forces of the world economic system or the global needs of capital. In exploring the purpose of education, we should not shy away from the links between education and the economy, but rather subject the nature and form of those links to a more radical critique. That inevitably involves exploring power relations, it also involves looking at the whole schooling system. For me the purpose of educations should be to allow us to collectively control and shape our society. But that means education itself becomes embedded in that society, no longer the prerogative of the walled gardens of the educational institutions. More (and hopefully more coherent thoughts) to follow. Today Google Labs released their new data visualisation store. Very impressive it is too, although it is not a straightforward task to register on the site, upload uses an XML format and you cannot download data. But the visualisation is pretty good and Google themselves have linked to a number of large Eurostat data sets. I have been working on data for the last couple of weeks. I am trying to build a TEBO – a Technology Enhanced Boundary Object (or objects) for explaining Labour Market data to Careers Advice, Information and Guidance (CAIG). Together with my colleagues from the Institute for Employment Research at Warwick University, I have been looking at TEBOs for some time. Need to build an understanding of how TEBOs may be used in ways that are empowering for practitioners, and ultimately for clients too. Preconfigure certain ways of thinking through use of scenarios; discussions can point into and lead from scenarios. In practice it is not so easy to develop such TEBOs. Identifying key problmes is probably the most useful approach. But then there is an issue in accessing different data to visualise as part of the process. A great deal of data is now publicly available. But I am no data specialist and have faced a steep learning curve in understanding and interpreting the data myself. then there is the issue of visualisation – I am mainly using Google Gadgets, although we are also working with Tableau (a powerful tool, but unfortunately only available for Windows) and IBM;s Many Eyes. All these tools are good, but are all extremely finicky about how the data is formatted. We are working with data in xls and Apple’s Numbers but I suspect longer term it would be better to use the Open Source R programming environment. And the hardest task of all is the storyboarding. At the end of the day we are trying to tell stories with data: TEBOs are a storytelling and exploration approach to learning. So for each TEBO I intend to make a short video explaining the key concepts and showing the various visualizations. We will also provide access to the raw data and to static versions of the graphing, along with explanatory notes. And for each TEBO we will try to construct an interactive visualisation tool, allowing learners to play with the data and displays. I also want to try to build some sort of simulations using the Forio tool. No doubt there is better software (and if anyone has any ideas I would be very grateful). But I sort of feel that the more social software, open source or free tools we can use the better. We want to encourage people to do it for themselves. And they have no money to spend on fancy software tools.We cannot possibly provide access to visualisations of all the data available. But if we cane explain what is possible, hopefully interested CAIG professionals will start there own work. And then who knows – a Careers Guidance data store? As the UK Government attempts to pay for ever more diverse campaigns emerge against attempts to cutback public services. One of the most interesting has been against cuts in libraries. The campaign has gone viral through Facebook and Twitter and gained the support of prominent artists and public figures. 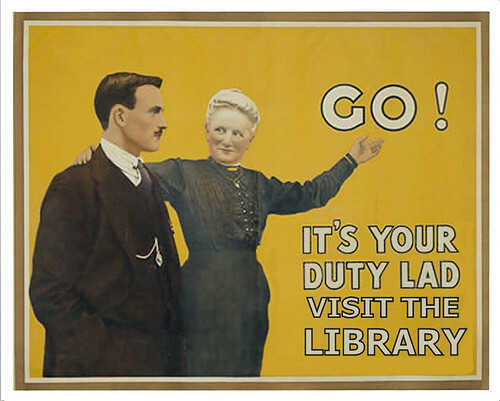 Of course part of the reason for the strength of the campaign may be nostalgia, another may be that the move to close libraries has upset many of the middle classes who voted for the ConDem coalition government in England. The Government’s arguments seem to be threefold. One we cannot afford libraries. Two, why should they be a public service and why can’t they be run by the private sector or by volunteers. And three that they are out of date in the internet age. The first two are predictable responses from aright wing government committed to reducing public services. But the latter is interesting as is the response. To some extent I guess this is based on nostalgia or on a feeling that a paper based book represents something different and more than a digital artefact. Partly it is based on a social inclusion agenda. But partly it is focused on the idea of libraries as a physical and social space, analogous to the role of pub. Even when information can be found through a simple Google search, even when we can chat directly with our friends over VOIP connections, even when our friends are measured in terms of connections om Facebook, we still value public spaces. And the library is a public pace lined to knowledge. Of course it is not the only one – we have schools and universities. But these have various restrictions and exclusivity based on age, income or qualification. In the UK libraries have represented one of the few public and social spaces linked to knowledge which have been open to all. And as such people are instinctively opposed to their closure or privatisation. View more presentations from MARIA PERIFANOU. We have just started a new project on Webquests. The idea is to use Webquests and a Collaborative Blended Learning model for learning with trainers in Small and Medium Enterprise in Poland, focused on Human Resources Management. The project is funded by the European Commission under a programme called the Transfer of Innovation. Pontydysgu’s Maria Perifanou has previously been using Webquests for language learning in Greece. Now we intend to develop the learning processes to new groups of learners in new countries and at the same time update the ‘old’ Wequest idea to utilise Web 2.0 technologies. As in any transnational project one of the first challenges in developing a shared idea of what we are all talking about! And the presentation above by Maria is intended to help us develop that process. The 2011 Horizon Report was published today. However whilst the impact of mobile devices on learning is becoming readily apparent, the impact of e-books is harder to assess. Of course it may be that students will access textbooks and academic publication on e-book readers, along with the accompanying Digital Rights Management. But I think we may be reaching the tipping point where academic textbooks and research are published online or in electronic editions and are not published in traditional paper based book format. Of course this may be somewhat disruptive for the academic publishing industry! It also raises interesting issues of quality. And in the longer run I wonder if students will shun e-book readers as such preferring to read open materials on reader apps on mobile devices. We may actually be seeing the zenith of the Kindle in just the same way as analysts suggest that iPod sales may have peaked. I spent most of the weekend clearing up my office. It was one of those jobs which starts out as a small thing – I had just run out of shelf space and ends up as a major spring cleaning operation. The biggest job was throwing out paper – bags full of it. What was all this paper? Most of it was photo copies or print outs of various academic papers and reports. there must have been hundreds. And to my surprise I realized that I had read or at least flicked through mots of them at one time or another in the past. But certainly not lately. I would not have had a clue where to find any of them, even if I remembered I had them. So why did I photocopy and print so much. Is it that in those days I did more academic research and now work more on development projects? I don’t think so. Or is it that the internet is dumbing us down? Do I spend all my days following tweets rather than reading anything serious. Although I don’t subscribe to the dumbing down thesis there certainly are changes in the way we access knowledge. I originally intended to write a short blog reflecting on my clean up. but the ideas have grown so here is the introduction to what I guess will be a mini series this week about how we are using technology for research and knowledge sharing. I am old enough to remember card index files as the way of searching for books and papers in the Swansea University library when I was a student. And much later, when I was appointed as a researcher at the University of Bremen, I used to travel to the UK to photocopy papers in the University of Surrey library (this was the nearest university library to Gatwirk and thank goodness, there were no Ryan Air type weight restrictions). Why not access on line resources? Because quite simply even 15 years ago there were few research resources available online. of course that has rapidly changed. Even with the annoyance of DRM restrictions, it is usually fairly easy to access research papers and outputs, even in smaller research areas. One of the other big changes we tend to forget is search. In 1995 search engines were fairly rudimentary. However we may moan about them, we now have choice of a wide range of pretty good search engines and with persistence can usually find what we are looking for online. Other changes? Ubiquitous, or near ubiquitous access. Most researchers, at least in the richer industrialized countries are online most of the time. And one of the big changes, at least in explaining why I had so much paper stored, is improvements in screen technology. Nowadays we even try to read documents on handheld devices. Even five or six years ago screens were small and lacked the resolution to make reading a comfortable experience. So we printed everything. I would go to the university to sue their fast laser printer to print collections of papers I had downloaded at home for the internet. In this blog I have focused mainly on the change sin technology and how they impact on research. In the next entry I will look more at socio technical changes and in particular at social software and changing research practice. At the moment we are doing a lot of work with careers guidance professionals. And part of this work is around the use of Labour Market Information in the guidance process. What jobs are available? What are future trends in employment? How much can a person expect to earn in any occupation? What qualifications are needed? Much of this information relies of statistics. There are a lot of statistics provided by governmental and other agencies. In the UK the data.gov.uk web site is providing increasing access to data and encouraging visualisations, mash-ups and reuse. We are a campaign established by journalists and statisticians to improve the understanding and use of statistics by government, politicians, companies, advertisers and the mass media. By exposing bad practice and rewarding good, we aim to restore public confidence in statistics. The tweet from DrEvanHarris led to an article by Nigel Hawkes entitled Questionable Claims on Government Pay.The recent campaign against rises in student fees in the UK has focused attention on how much graduate earns. And the article suggests that many of the figures quoted in UK newspapers may give an inflated impression of graduate starting salaries because of the way these figures are compiled. The Straight Statistics website provides a number of excellent and free resources including a simple guide to numerical and statistical traps, Making Sense of Statistics. a simple guide to numerical and statistical traps, Although the guide is “ primarily designed for journalists and press officers”, the web site says it may be interesting to others as well. And indeed it is, providing clear examples of how statistics can mislead. How big is the gap between the earnings of men and women? According to the Office for National Statistics (ONS), it is 12.8%. But the Government Equalities Office (GEO) says it is 23%. And the Equality and Human Rights Commission (EHRC) says it’s 17.1%1. The differences in these figures arise from the different methods used to produce them: the ONS includes only full-time employees, excluding overtime and part-time workers. The GEO includes part-time workers because it says more women than men work part-time and it is wrong to exclude them. The EHRC figure uses the ONS data but compares the mean salaries not the median. It justifies this by saying than men are over-represented at one extreme of the earnings range, and women at the other. Three figures – all of them right – but asking what is being compared and how it was calculated tells us why there is a difference. In around 1995 I was appointed by Bremen University to manage a relatively well funded European project on the teaching of teachers and training for vocational education and training. The project had partners in seven or eight countries. I set up a project newsletter and after three or so months announced I would no longer be ending postal copies but it would be sent exclusively by email. There was considerable opposition to this, one person (the Swedish partner) saying he had a Mac and documents would not be compatible, others claiming that they lacked the skills and technical infrastructure to manage a project electronically (my own professor used to get his secretary to download and print off copies of any emails to him). But the shift was made and by the end of the three year funding period no-one could imagine going back to post as the main means of project communication. Interestingly, one of the parters offered us a space on a relatively mature project management system and although we all agreed to use it I doubt we will. In my experience these systems are too restrictive and do not provide sufficient facilities for active collaboration. Of course they usually provide forums, but I have never worked on a project where there has been prolonged collaboration through a forum (despite most projects trying). The one application not on my list is of course email. And despite having taken part in many projects where it is decided not to use email as the primary means of communication, after a short period everyone reverts back to it. Is this because of familiarity or because it perhaps is the quickest and simplest means of communication? None of the applications listed require any great technical abilities (although firewalls and interoperability issues do sometimes arise). However they require changes in our working practices – in our socio-technical competences. And that can be difficult, especially where researchers are not used to working in an open and collaborative environment. In terms of distributed international projects it is probably skype and Flashmeeting which have made the greatest impact. even then it takes time to get used to working online in synchronous environments. Online meetings require preparation and moderation – just as do face to face meetings. Yet because it is online there is often a tendency not to prepare in the same way as we would for a face opt face workshop. I am not quite sure how DropBox is going to pan out in all of this. It certainly has a clever financial model – my free account was overflowing within a month of setting up an account. And it is an uncertain science. Whilst organisations like Jisc have invested considerable expenditure into developing relatively heavyweight online research environments I do not know of any research into how we can use loosely coupled social software tools for research projects. We are maki9ng up our own practice as we go! I am very happy to see the launch today of the Purpose of Education web site, initiated by Doug Belshaw and Alec Stewart. The recent uprisings in Tunisia and Egypt have shown the power of social media for not just discussing politics but for mobilising. And the student protests in the UK against increases in university fees and the abolition of the Educational Maintenance Allowance have shown a willingness by young people in the UK to act around education. However, it is clear we need a wider debate about the whole purpose of education, especially as technology is opening up new possibilities for learning. What is your vision for the good society? What is the part that education can play in achieving that and what is the part that others need to play? Who are these others? What is/what should be their relationship to education? What are the building blocks we have in our schools and universities already that could move them towards that role? What are the building blocks outside formal education? What are the impediments to change and what causes them? And are there good reasons for these? What can I see of merit in the ideas of those who disagree with me? Do the ideas I suggest draw on the expertise and insight of others? Do the ideas I suggest offer enough benefit to outweigh the disruption that they would cause in their realisation? how would we get there? Posted in education, learning, politics, social media, Wales Wide Web | Comments Off on What is the Purpose of Education?